Hi, i’m Chris Wightman. Thank you for visiting our website. Growing up in a fishing family, instinctively using sustainable methods along the East coast I have always been passionate about catching and eating the finest quality fish and seafood. 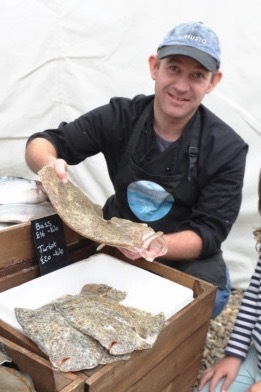 In 2009 (and having been at sea for 18 years) I decided to step ashore and turn my passion into my mission: to source the finest UK, day boat fish for a new enterprise based at Friday Street Farm Shop, Farnham. Maximus Fish shop was born! In 2012 we installed our smoker so as to produce all of our smoked fish in-house. Since then I have been developing our range of age-old, artisanal smoked fish including our award-winning coffee cured smoked salmon. All of our smoked fish is brined in Spanish sea salt and smoked over locally sourced Oak dust by myself to ensure the consistent high quality that our customers have grown to expect. Still a family business, we look forward to an exciting future ahead of sustainable, fresh, tasty and nutritious fish……it’s simple really!